We arrived around noon with Kristóf, a young photographer friend, at the border dividing Hungary from Serbia. On leaving the quiet village of Röszke, suddenly a camp of two or three hectares lay before us on both sides of a small country road that was barely paved. 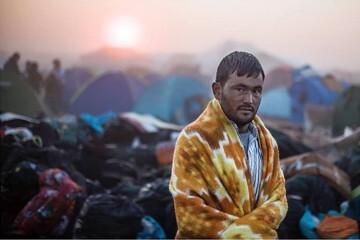 There were tents of all colors, a few larger tents, two greenhouses from a nearby farm transformed into dormitories, forty mobile toilets and an impressive number of people. 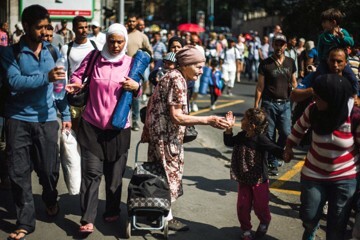 It was the point of arrival and reception of refugees in Hungary. At the entrance to the camp nearest the village t two German volunteers were directing traffic and sending all the cars toward a makeshift carpark in a field. They only let through the (few) Hungarian police cars present, medical vehicles and deliveries from the various associations providing assistance to the refugees. On the railway that cuts at right angles across the small paved road no train has passed for years. Fortunately, since the flow of people there was dense and without interruption. You have to imagine it as being a bit like the arrival of groups at a European meeting: an unbroken line of pilgrims who arrive on foot from the south, heading north. I was immediately struck by the number of families with children, sometimes babies in strollers that were not really practical on the railway sleepers, pregnant women, grandmothers and men of a respectable age, aided by those who were younger. I spent a good half-hour without being able to say a word or move, swallowing my tears. The backpacks were generally much smaller than those of the young people who come to Taizé for a week. The best equipped had hiking backpacks but many people had only plastic bags, as if they were returning home from shopping at a supermarket. Back in Hungary I spoke with people from the Hungarian Office of the United Nations High Commissioner for Refugees who had come from Budapest, they were conducting a count at the gate. Among them was a Syrian woman who was constantly repeating in Arabic the most important information to the newcomers: "After a 10-minute walk you will find the initial reception camp, there you will find food, doctors, individual tents for you to rest, clothing, walking shoes, blankets if you want to spend the night ... then Hungarian blue buses that will transport you to the refugee camp where you will be invited to file your application for asylum." According to the Treaty of Dublin that Hungary was trying more or less to respect, the asylum application must be made in the first country of the European Union where the refugee arrives. He must complete a form and leave a fingerprint. It was this last point that frightened many people... During the day of Saturday, September 12, the Hungarian authorities transported 4,500 people by bus to various refugee camps, compared to the numbers the people from the United Nations agency whispered in our ears at 10 pm: they had counted 11,000 passages! Those who did not take the bus went off through the corn fields that were particularly high at this time of year. Most went directly to the smugglers who were waiting at the nearby gas station (1.5 km). They also offered to take us to Budapest (about 220 km) for 100 euros. We were unable to get the rates for Vienna or Munich. The poorest continued on foot to the nearest train station but were often stopped by the police who patrol the region. It was amazing to see how the reception camp was organized without any central coordination and how organizations of all kinds were working together. 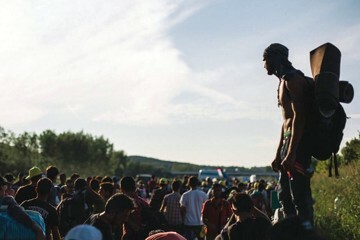 It was another image of Hungary and Central Europe, one that the media were not necessarily able to transmit. 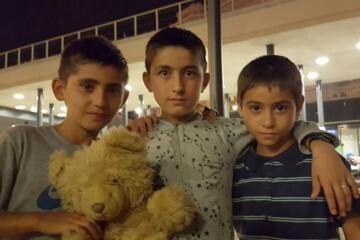 I saw young people arrive from Budapest by car and ask if they could help. Five minutes later they had a "volunteer" label on their shirts and they were distributing food or picking up the garbage that was piling up in ever higher mounds on the edges of the camp. I am convinced that something essential has started in Hungarian society and that many today would like to continue to provide concrete support to long-term refugees. Yes, it’s true, some politicians are playing a horrible political game where the most important thing is the upcoming elections. Yes, the Hungarian bishops are having difficulty interpreting the words of Pope Francis. Yes, there are real fears in the population that need to be listened to and understood. But there was so much good will, so many people in the streets, at railway stations and border spontaneously came forward to help the refugees. All these people have demonstrated that hospitality is not an empty word and that it still exists in our society. 1. Collect offers to help refugees, thus bringing emergency assistance. 2. Engage in dialogue within Hungarian society. 3. Assist in the integration of refugees who file their asylum application in Hungary. Concretely, from next week, the volunteers from Taizé will go daily into a former orphanage north of Budapest, where all the under-age refugees who arrived in Hungary without their parents have been gathered. 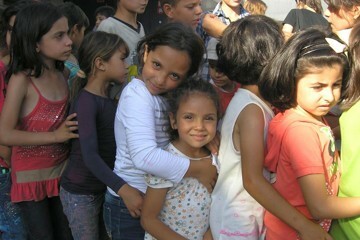 The hope is to help these children who have lost everything and make their days more beautiful.